On Oct. 11, 1904 the Soda Lake School District #1119 was established. It was comprised of the following lands: Sections 3 to 10 inclusive, 15 to 22 inclusive and 27 to 30 inclusive in twp. 55, rge. 14, W. of 4th. The senior trustee was J.H. Weldon of Soda Lake, Alberta. On Feb. 11, of the following year the district borrowed eight hundred dollars for the purpose of erecting a school building and furnishing it. The treasurer was A.M. Boutillier of Soda Lake. In the following years lands were added or withdrawn. In 1928 all the sections of land comprising the Berehometh School District #1499 were added to the Soda Lake S.D. #1119, and the former school district was dissolved. Owen Williams of Vegreville was appointed official trustee. On March 8, 1929 the name of the school district was changed from the Soda Lake School District to the new Hairy Hill School District. The same year on March 11, the new school district borrowed the sum of twenty thousand dollars for the purpose of erecting a brick veneer school of six rooms, with full equipment, on the south-west corner of the Hairy Hill town- site. The name Soda Lake became extinct. As the number indicates this was a comparatively newer school district. It was established on March 17, 1926, and took the following lands: Section 31 and N.E.’A of sec. 30, twp. 56, rge. 13; sections 25, 26, 35 and 36; N.E.Vi of section 27; east half of section 34, in twp. 56, rge. 14; section 6 and that portion of section 7 lying south of the Saskatchewan River, in twp. 57, rge. 13; sections 1 and 2, and those portions of sections 11 and 12 lying south of the Saskatchewan River, in twp. 57, rge. 14, W. of 4th. The senior trustee was George Leonty of Desjarlais, Alberta. Two days later in 1926 a site was selected, comprising three acres situated on N.E. corner of N.W.Vi section 36, 56, 14, W.4th. The name Deep Lake was chosen because near the site there is a lake, not too large, but deceivingly quite deep. 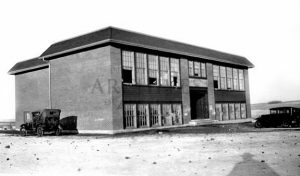 On Aug. 7, 1926 the district borrowed the sum of twenty-seven hundred dollars for erecting and equipping a new school house. The school was built and functioned for some twenty-five years. The treasurer in 1926 was Mike Chornohus of Desjarlais. Few changes were made in the boundaries of this district. On Nov. 2, 1937 the Deep Lake School District #4242 was included in the Two Hills School Division #21. The final chapter in the life of this small school district took place on Oct. 7, 1953 when the site and buildings were put up for sale. The author recalls with nostalgia spending an interesting week doing his practice teaching in the Deep Lake School in April, 1936.